A SPECIALLY-funded ferry is being chartered to sail 300 veterans from Portsmouth to the beaches of Normandy to mark the 75th anniversary D-Day. War heroes will set sail from the city on June 5 after a stunning day of military parades and celebrations in Portsmouth, before arriving in France on June 6 – the anniversary of the historic invasion. Portsmouth has been officially named as the focal point of Britain’s commemorations after a joint campaign by The News and Portsmouth City Council. And with the eyes of the world’s media expected to be trained on Portsmouth, military top brass have issued a rallying cry to residents to do all they can to support the spectacle and immortalise the bravery of the surviving Second World War veterans. 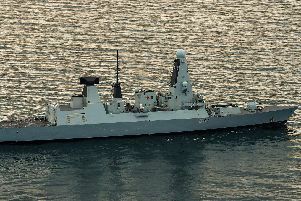 Commodore Jim Higham, commander of Portsmouth Naval Base, was excited by the city’s plans – ones he said the Royal Navy was very eager to support. The 30-year naval veteran said: ‘The people of Portsmouth have never let the navy down, they’re there at all our most important moments. ‘Where else could do this other than Portsmouth? It's the home of the Royal Navy and it was the home of Britain’s D-Day efforts. The plans were announced by the vice chief of the defence staff General Sir Gordon Messenger during a visit to the D-Day Story museum in Southsea today. He praised the people of Portsmouth for fighting to stage the event and added: ‘Portsmouth as a city should be hugely proud of the role it played in D-Day. The announcement was attended by almost a dozen Second World War veterans who were delighted by the news. Robert Gale, 96, of Headley, was among the first to land on Gold Beach on D-Day. He was a signalman in a landing craft. Reflecting on the invasion, he said: ‘We had to dodge all the beach defences and mines that would have blown us to pieces. ‘When we landed I was on the ramp seeing the soldiers off and I shouted at them: “Get off the beach as fast as you can, don’t stop for anything”. They ran like rabbits. ‘It was dangerous though. One of them standing next to me was shot. Veterans are urged to apply for places on the ship to Normandy through the Royal British Legion, which has funded the crossing with additional cash from the Treasury. The deadline is Monday, February 4. Costs are covered by the legion. Bob Gamble, of the Royal British Legion, ‘saluted the bravery and sacrifice’ of those involved in the invasion. ‘The veterans will be the VIPs at this event and we will make sure their every need is catered for as they travel back to Normandy to take part in this landmark event,’ he said. The five days of events in Portsmouth start on June 5 and will include a military parade along the seafront with performances by military bands, readings by VIPs and a flypast featuring period aircraft. The first 'Portsmouth Revival Festival' celebrating the food, music, dancing and vehicles of the time will also be held culminating in a 'Sunset Concert for Heroes' featuring acts including the Military Wives Choir and the D-Day Darlings. Up to 2,000 British military personnel will be involved in the commemoration.